Pontroyal is in Provence, France. Domaine et Golf de Pont Royal is an area of more than 450 acres centrally located in south west Provence, about 30 minutes drive from Aix-en-Provence, Avignon, Marseille airport and the Mediterranean coast. A traditional hilltop village surrounded by many sports facilities, walking/jogging trails, swimming pools, tennis and basketball courts, horse riding, boating, a superb golf course and has much more. 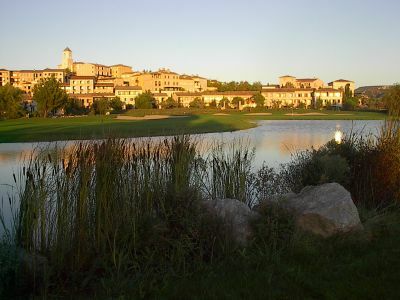 It is very popular for vacations and with families, golfers, visitors to Provence and nature lovers. Also in the village is a large conference centre where many organisations meet staff and clients. There are several bars and restaurants, shops and a small convenience store. Created in the 1980's with the help of a Californian architect, Pontroyal combines the best of a traditional village in France with a country club, but has the feel of something older. Now well developed, the old village has been completed and newer properties are being established on a nearby site with their own facilities. A hotel in the old village is popular and many private villas and apartments are available to rent while there is also a holiday company which has many small apartments and villas available. The golf course is regarded as one of the top 10 in France and has bar and restaurant facilities overlooking the hills of Provence. Marseille, Provence airport is about 30 mins drive. Avignon has some regional and other European flights, also 30 mins drive. Nice airport is a 2 hour drive. Nimes has some shorthaul flights, 1 hour drive. Avignon (30 mins drive) has a TGV (high speed train, 2hrs to Paris) and a regular station. Marseille and Aix-en-Provence are similar, although Marseille train station is a little further away. Pontroyal is on the N7, 10 Km (6 miles) east from auto route A7, Junction 26 at Senas, between Avignon and Marseille. There are many interesting towns, villages and historical sites within a one hour drive of Pontroyal. Many of these have a significant Roman influence from 2000 years ago. See Provence for more details. Three major cities are all about a 30 minutes drive. Avignon has the Palais des Papes, a famous half bridge on the river Rhone and a picturesque old town along with a very large modern shopping complex. Aix-en-Provence (Aix) has a very old pedestrian centre with great architecture, shops, markets, bars and restaurants while Marseille, the second largest city in France, is bustling and the area around the old port (Vieux Port) is always worth a visit. Nimes and Arles both have Roman amphitheatres still in use today while Cassis is a pretty Mediterranean town with a beach, harbour, boat trips to the Calanques(small fiords) and many shops, bars and restaurants. Les Baux is a famous old hilltop village with many tourist attractions within the ramparts. Nearby the Roman town of Glanum was excavated in the 1920's long after Van Gogh painted some of his famous works over the countryside above, without knowing the history below. Visit the museum at the entrance first. Neighbouring St Remy-de-Provence is always popular with tourists and local people. A little further afield the Camargue is different. Keen cyclists and others may wish to visit Mont Ventoux, while the Verdon Gorge is compared to a mini Grand Canyon. Further Roman buidings can be found at Le Pont du Gard or Orange (Provence), Vaison la Romaine and Isle sur la Sorgue. There are many sport facilities within Pontroyal, some may incur a charge. There are various swimming pools and one associated water slide. You can rent boats, cycles and golf buggies or walk or jog around the many tracks which have great views across the Alpilles hills and Luberon mountains. Boules are played in the old village square overlooking the boating lake. The 18 hole golf course, designed by Seve Ballesteros, is regarded as one of the top ten in France and has an annual professional tournament in October televised in France. More golf information at  is available. A new 6 hole course for practice or beginners opened recently. Visit some of the nearby towns and villages which often have a morning outdoor market each week. The smartest locally is Lourmarin on Friday, while Salon de Provence (Wed) and Cavaillon (Mon) are always popular. There is a nearby market every morning in one of the local towns or villages. For more extensive (and expensive) tastes, Aix or Avignon are for serious shoppers or those just browsing. Pontroyal has an outdoor summer market on Thursday morning. Many visitors to France are wine lovers and visits to vineyards in the Rhone valley will be well rewarded not only by wine tasting and buying, but the journey through the Provence countryside to the small pretty villages where some of the best known wines may be found. Some of the better known can be found in Vacqueras, Gigondas, Chateauneuf du Pape, Beaume de Venise. Tavel is noted for Rose wines and Cassis has some good whites. Provence Rose is found everywhere and goes well with any meal in the warm summer months. Hotel du Golf in the village has reception opposite, over the road in La Maison de Pontroyal. Moulin de Vernegues is just outside the estate on the N7 by the 2nd golf hole. There are also many villas and apartments available to rent by the day or week. The reception area in the village (La Maison de Pontroyal) has free WiFi for a limited time, or you can pay for extended periods. Mobile or cell phone signals are good, as you would expect on a small hilltop village. This page was last edited on 12 February 2013, at 20:09.